Chronic venous insufficiency (CVI) is a condition that occurs when valves within the leg veins are damaged allowing blood to leak backwards and pool in these veins. When you are standing, the blood in your leg veins has to be pushed up against gravity to return to your heart. Your leg muscles actually act as a pump by squeezing the veins deep in your legs and pushing blood back toward your heart. Every step you take works the pump to push blood up against gravity. Series of one-way valves throughout your veins keep blood flowing upward. Sitting or standing for extended periods can result in the blood in your leg veins pooling and the pressure inside the veins increases. This increase in pressure can stretch the walls of the veins and damage the valves. Failure of the valves to hold blood against gravity leads to sluggish movement of blood out of the veins, resulting in swollen, tired legs. What are the Symptoms of Chronic Venous Insufficiency? Chronic Venous Insufficiency may begin with mild nuisance symptoms. However, left untreated it can progress permanent skin changes with darkened discoloration and thickened skin to a more serious medical condition involving complicated wounds and skin infections. What are the Risk Factors for Chronic Venous Insufficiency? CVI commonly occurs in people who have a history of phlebitis and deep vein thrombosis. Phlebitis occurs when a superficial or deep vein becomes swollen and inflamed. This inflammation can cause a blood clot in the deep veins of the legs, a disease known as deep vein thrombosis (DVT). The blood clot blocks blood from flowing toward the heart, so the blood pressure is increased in the vein resulting in damage to the valves. Chronic venous insufficiency that develops as a result of DVT is also known as post-thrombotic syndrome. Duplex Ultrasound is a standard test performed to evaluate the integrity of your vascular system and rule out any blood clots. Venography or Intravascular Ultrasound are additional studies that may be used to assess for blockages in the veins. How is Chronic Venous Insufficiency Treated? Early intervention and prevention of complications of wounds and wound infections are the goal of treatment. Treatment plans are aimed at decreasing the blood pressure in the veins to reduce swelling and symptoms and increasing the return blood flow back to the heart. More serious cases of CVI may be treated or with surgical procedures. Fewer than 10 percent of people with CVI require surgery to correct the problem. Avoid long periods of standing or sitting: If you are traveling and will be sitting for a long time, flex and extend your legs, feet, and ankles about 10 times every 30 minutes to keep the blood flowing in the leg veins. If you can get up and walk do so. When standing, keep your leg muscles moving. Wear compression stockings prescribed by your physician to improve venous circulation. Elevate your legs while sitting and lying down with your legs elevated above the level of your heart (blood runs down hill). Exercise regularly. 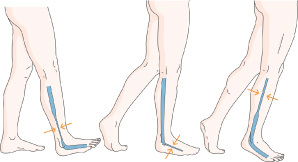 Walking works the leg muscle pump. Protect your skin: Keep your skin clean, moisturized, and free of open wounds that can increase your risk of infection. Lose weight if you are over weight. Excess weight increases the pressure your veins have to work against. Compression Stockings: In most people with CVI, compression stockings are essential to the treatment plan. Compression stockings are elastic stockings that squeeze your veins and assist the leg muscle pump in pushing blood back up toward the heart to decrease swelling. They are available in different compression strengths and lengths and should be prescribed by your vascular specialist according to your medical needs. Many insurance carriers cover them with a prescription. There are brands available that are remarkably stylish and will blend well into any wardrobe. They should be worn regularly during the day, and removed at night. With regular use they can decrease symptoms of swelling, aching, chronic skin irritation, help heal and prevent venous stasis ulcers. Ligation and Stripping often are performed in combination. Vein ligation is a procedure in which a vascular surgeon cuts and ties off the problem veins. Stripping is the surgical removal of larger veins through two small incisions. Vein Bypass is used for treatment of CVI in the upper thigh or pelvis and only in the most severe cases, when other treatment options have not been effective. It involves using a graft, or a transplanted vein from elsewhere in your body to reroute blood around the blocked vein that is causing CVI. Angioplasty and Stenting is a procedure that opens a narrowed or blocked vein. Angioplasty uses a tiny balloon to push open a narrowed or blocked area in a vein. The stent is a tiny metal mesh tube that is placed inside the vein to prevent it from narrowing again. The procedure is performed through a small needle puncture in the back of the knee, or in the groin. A contrast dye is used to help the surgeon see the blood vessels on x-ray and direct the balloon and stent into the correct positions. Last Modified: April 17, 2018. Contact Rebecca Bellini with questions about the content of this page.